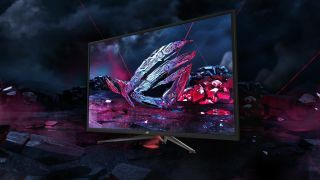 Kicking off a new era of impressively large gaming monitors, Asus Republic of Gamers (ROG) has announced three new VA panels in its upcoming Strix XG HDR range at CES 2019 – the 32-inch Strix XG32VQR, the 43-inch XG438Q and the 49-inch Strix XG49VQ. The entry-level 32-inch model sports a QHD resolution (2560 x 1440) in a 16:9 aspect ratio with a 144Hz refresh rate on a curved panel, while the significantly larger 43-inch model boasts a 4K resolution (3840 x 2160) in a 16:9 aspect ratio with a slighter lower 120Hz refresh rate on a flat panel. Ultra-wide enthusiasts will surely be excited for Asus' 49-inch model, which offers a 'superwide' resolution (3840 x 1080) in an eye-opening 32:9 aspect ratio along with a 144Hz refresh rate. The monitors all boast a response time of 4ms (GTG), FreeSync 2 support and HDR-certification by VESA, meaning each display had to meet certain criteria for displaying HDR content in order to earn VESA's coveted DisplayHDR badge. Unlike the 32-inch and 49-inch models, which have a peak brightness of 450 nits, the 43-inch Strix XG438Q is DisplayHDR 600 compliant, meaning it's capable of a peak luminance of 600 nits. While pricing and exact release details have yet to be announced, Asus is planning to bring all three monitors to market in Q2 2019.